A new Brain Injury ID card has been introduced as part of the Headway UK Justice Project. The aim of the card is to provide people wi th brain injury with support and confidence in social situations as well as any interactions with emergency services. 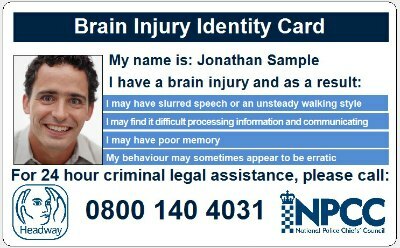 The card has been developed as part of the Justice Project, the objective of which is to raise awareness of brain injury throughout criminal justice systems across the UK, and has the backing of the National Police Chiefs’ Council, Police Scotland and the Police Service of Northern Ireland. The card displays a criminal legal assistance number that can be called to request specialist legal advice or representation. It also displays the Headway helpline number and website details. Applications can be made online or by post and if you need help to apply you can contact us on 01772 791460 or your local Headway group. The card is free-of-charge and the application can be made by a brain injury survivor or somebody else can apply on their behalf. A passport-sized photo of the survivor is required and brain injury verification and confirmation that the survivor receives support from your group or branch.